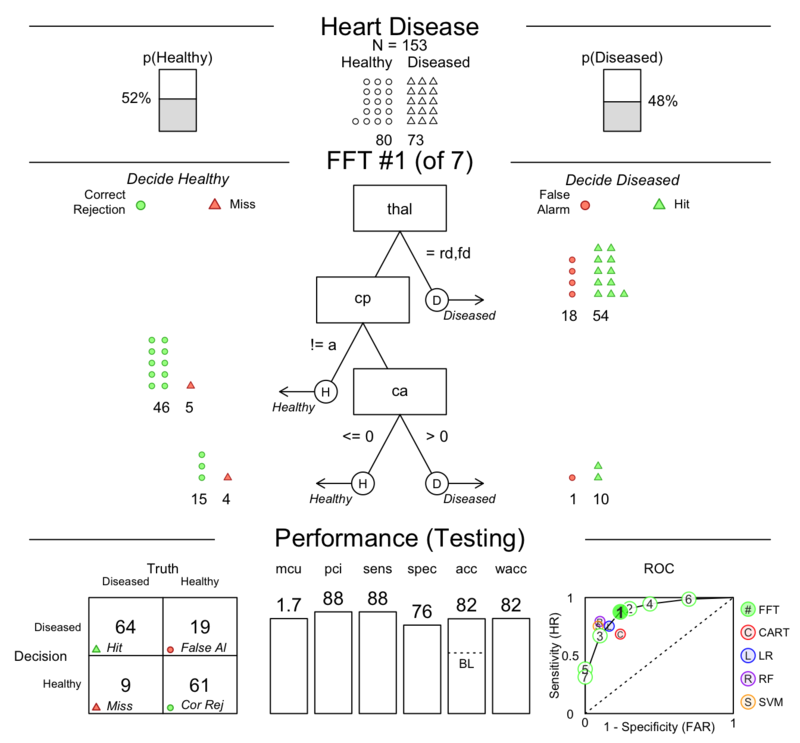 The FFTrees package creates fast and frugal decision trees (FFTs). Fast and frugal decision trees are very simple heuristics decision algorithms that, in contrast to regression and more complex algorithms such as random forests and (non-frugal) decision trees, allow people to make fast decisions based on minimal information. FFTs are not just easy to use, they can also predict data as well, if not better, than more complex algorithms such as regression (Gigerenzer and Todd 1999; Martignon, Katsikopoulos, and Woike 2008). Because they are so effective and easy to use and, fast and frugal trees have been used to improve decision making in medical (Green and Mehr 1997; Jenny et al. 2013) and financial (Neth et al. 2014) contexts. The purpose of FFTrees is to allow anyone to quickly and easily generate, visualise, and use FFTs for their own data. Gigerenzer, Gerd, and Peter M Todd. 1999. Simple Heuristics That Make Us Smart. Oxford University Press, USA. Green, Lee, and David R Mehr. 1997. “What Alters Physicians’ Decisions to Admit to the Coronary Care Unit?” Journal of Family Practice 45 (3). [New York, Appleton-Century-Crofts]: 219–26. Jenny, Mirjam A, Thorsten Pachur, S Lloyd Williams, Eni Becker, and Jürgen Margraf. 2013. “Simple Rules for Detecting Depression.” Journal of Applied Research in Memory and Cognition 2 (3). Elsevier: 149–57. Martignon, Laura, Konstantinos V Katsikopoulos, and Jan K Woike. 2008. “Categorization with Limited Resources: A Family of Simple Heuristics.” Journal of Mathematical Psychology 52 (6). Elsevier: 352–61. Neth, Hansjörg, Björn Meder, Amit Kothiyal, and Gerd Gigerenzer. 2014. “Homo Heuristicus in the Financial World: From Risk Management to Managing Uncertainty.” Journal of Risk Management in Financial Institutions 7 (2). Henry Stewart Publications: 134–44. Phillips, Nathaniel D, Hansjörg Neth, Jan K Woike, Wolfgang Gaissmaier, and others. 2017. “FFTrees: A Toolbox to Create, Visualize, and Evaluate Fast-and-Frugal Decision Trees.” Judgment and Decision Making 12 (4). Society for Judgment; Decision Making: 344–68.